Product #16646 | SKU 301 | 0.0 (no ratings yet) Thanks for your rating! 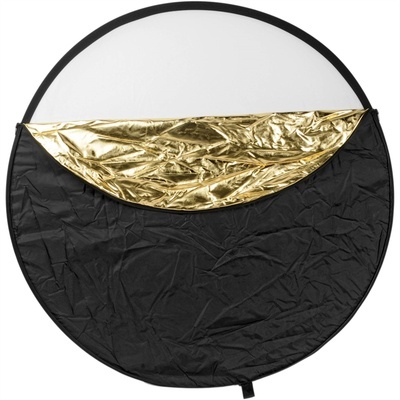 The Westcott 40.5" 5-in-1 Collapsible Reflector is versatile in the field and in the studio, providing shadow-lightening detail in your subject, using available, or studio lighting. It starts out as a translucent white disc -- perfect for softening direct sun, or lights without diffusion. Use the removable, reversible zippered slipcover to reflect light into shadow areas of your subject. Your choice of colour -- silver, gold, white, black mix -- will be determined by the lighting conditions, and your personal preference. This 40.5" (1 m) disc is suitable for 3/4 length portraits, and medium still-life setups. It folds down to 1/3 its open size, and comes with a storage sleeve. We suggest the purchase of a pivoting arm and stand, to hold the disc where needed -- especially if you are working without an assistant. Gold produces a natural, golden fill that is great for sunsets, jewellery, and indoor portraits. The black side diminishes unwanted reflections or colour casts.